LZ were not interested in going for the short Slide and they insisted on going for the tallest slide. Well, it was their day as well as their fun so why not? Obviously, one round of it was not enough for them. This year PTM (Parents-Teacher-Meeting) is quite unlike from the past 2 years. 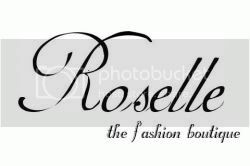 We need only go to 1 place for the meeting and we arranged the timing one after another. We looked forward to getting their results (we already knew their papers results but not the overall results). This is Z's FIRST exams and PTM (primary school). We heard very positive comments from Z's teachers about him. He has made us proud! He scored more than 90% for all his subjects, including Chinese! He scores full marks for English oral composition "My hobby - drawing". He brought along his best art piece and presented to his class. For Chinese, I think he did quite well, otherwise I don't think he will scores more than 90%. It was 我最喜欢的水果－ 西瓜。He brought along a big slice of watermelon for the oral which he finished in class. Haha.. I remembered my boy often tells me he wants to get all the badges and he strives to be a good student and do well in his studies. He hopes he will be appointed as a prefect when he goes to P3. Looks like my boy is trying his best to work towards his dream. L did very well for her Maths too! I better mention that LZdaddy was the one who coach her on both the subjects. 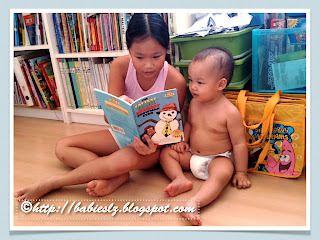 Hehe... We pulled her out from the Maths tuition this year and decided that LZdaddy would coach her on these 2 subjects. I think we made the right move. Yes, even though he travels often, he makes efforts to coach her whenever he is in town. Overall, we are very HAPPY with our Babies' results. LZ hope they will score better than this mid year exams and I know my babies will do their best. Little Beanie loves to read... Most of the times, it is L & I reading with him. The other boys (my man & my Z) prefer to do other things with Beanie, the boys stuffs. L loves both her brothers, especially Beanie. She said he doesn't argue with her or fight with her! Haha... Wait till Beanie is older and we shall see if she says that again! 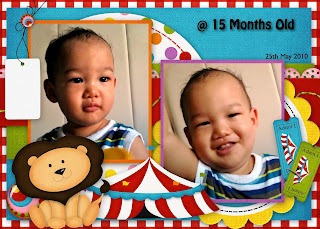 ♥ one of the molars is growing out and looks like the other first molars are growing out too. His gum is swollen. ♥ when he wants something, he either point it to you, try to say the words or pull us to the place to get it. ♥ nod or shake his head to indicate if he wants or not. ♥ when he wants milk, he says 'nen nen' and lie down on the bed. So cute! He is so used to me breastfeeding him on the bed. In the boxes: Tuna with princess (L) & cars (Z) pasta and sausages. I am still trying to finish off the amount of cute pasta I have. Gosh! I didn't realise I have so many packets! 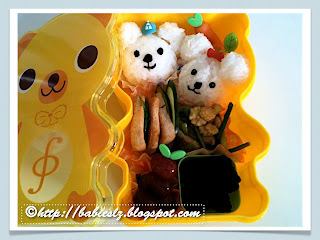 Today is just simple bento for my little ones. Too early in the morning and I was too lazy to do anything cute for them. 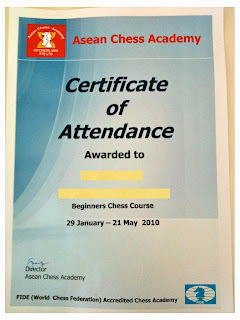 Z completed his Beginner Chess Course! Yeah! He was very happy and so was I! 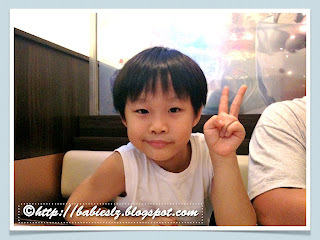 This was something that he wanted to do (when he goes to Primary) since he was in kindergarten and his wish came true. He told me he enjoyed the course throughout. But I wonder why there isn't any forms for the next level? Update: My boy forgotten about the form to join the next level! Anyway, we won't be able to send him to school for that on Saturday. He said it's ok and he enjoys teaching jiejie and play chess with her. I am still hoping to find a place (near my place) to teach him the next level. It is such a waste to stop when he has passion for it. In the box: Bear shaped rice, taukua, pork fried with veg & baby corn, grapes & blackberries. Today is Z's last lesson of chess and he will complete the beginner course and I convinced him to use this cute bento box that I bought recently. My kids sometimes choose which bento boxes they want to use. Can't believe that I have prepared more than 200 bento for my family! Most of it are for my princess. It all started because of her and we both like cute things and also she used to be fussy about food. But not anymore! I think making the food looks cute does help. 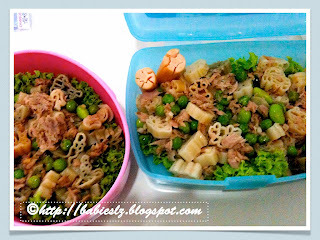 Beanie's (so called) 1st Bento! I didn't take any pic of theis bento. It was meant for Z but my boy rushed off from the car this morning when I send them to school. Haiz... LZdaddy is not in town again.. Since Beanie yet to have his breakfast, he finished it for Z. I think he likes it! He kept looking at the cute pooh shaped bread and smiled. Hmmm... I think I should name this as my bento #199. I think this is my first time bringing my 3 kids to a restaurant alone for dinner. We often go for fast food when I'm alone with them coz it is easy. I was reluctant tonight but my kids convinced me they will behave and I was too angry to face my helper at home. L & Z happily help themselves to the sushi and got some for Beanie and me. I was so worried we ordered too much.. Usually LZdaddy is with us to finish off what they can't finish. Besides taking sushi from the counter, I ordered kids meal for L & Z and a udon soup for Beanie and myself. It was an enjoyable meal even though Beanie spilled drink on me. They were well behaved throughout and even did some shopping! I would love to do this more often with them. In the boxes: Fried mee tai mak with pork & Japanese fishcakes, Anpanman crackers, tomatoes & raspberries. Mee tai mak is one of those noodles that I often have in my fridge. I cook it whenever I am lazy and want to prepare a quick meal for my 3 babies. Beanie likes it with soup and my 2 older ones like it fried. They have not have this for quite a while so I decided to prepare this for their bento today. I wanted to fry more so that I can pack some for LZdaddy as well but too bad, I have a packet of it only and he is left with one small bowl of it for breakfast. These pics may not be very clear but it is priceless and precious to me. 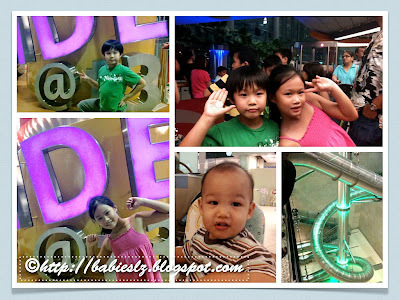 Pics were taken after meal at the foodcourt. 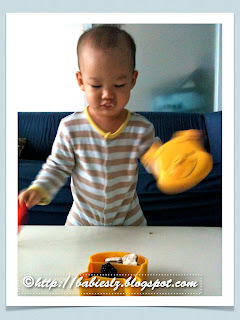 Z most of the time finishes his food fast and once he finishes, he will go over to his brother and play with him. Love the way he says "Didi, hug gorgor!" "Didi, give gorgor a kiss!" Sometimes his baby brother pushes him away and sometimes does what the gorgor ask him to do. 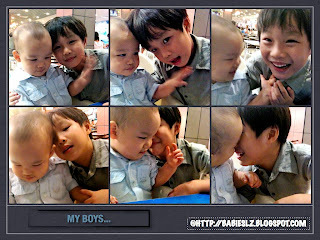 When Beanie was a newborn, Z doesn't really know how to play with him but now that he is older, the brothers spent lots of time playing together. Beanie is so used to showering together with Z nowadays. When it is time to shower, he looks for his gorgor. Z will get their towels (or Beanie sometimes take his own towel first) and both happily go to the bathroom. 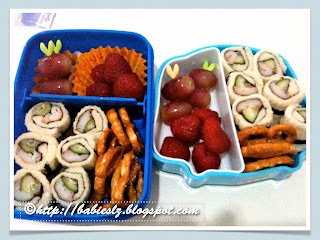 In the boxes: Bread sushi with crabsticks & cucumber, mini pretzels, grapes & raspberries. 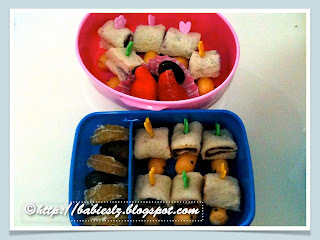 I am quite lazy to prepare bento now that the exams is over and school holiday coming. Z requested for sushi again and L commented "Huh? Sushi again? Why you always ask for sushi?" and said she wanted bread. So I suggested making bread sushi to please both. See? Tough to prepare bento at times when both ask for different food. Glad that there is something to please both of them. When I picked them up from school, L said her friends tried it and they liked it! They asked if I can prepare more for them as well! Errrr... I didn't promise my girl but told her I will try to make more the next time. I think this will be a great party food! If you are preparing this, remember to place a piece of seaweed before putting the crabsticks or cucumber so the bread will not be soggy when your child eat it. Hurray! Exams over!!!! 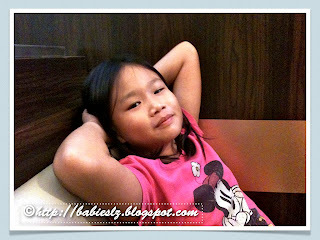 Time for my babies to relax and have a very good meal at their favourite restaurant, Swensen. My princess thinks she will do well for her Maths coz she has LZdaddy to coach her. She is not confident with her Chinese & Science. This is the First year she is taking Science and that's why she is not so confident. She thinks her English & Chinese results will drop as she has compo from this year onwards. Little Beanie enjoyed too! He ate so much! 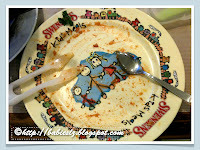 And finished a plate of spaghetti too! Sometimes, I wonder if he ate too much... 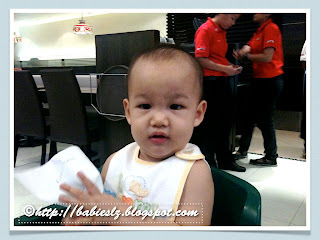 He is only abt 14+ month old and yet he ate a plate of it and fries and soup! We told our babies that they will get a present each if they score band 1 for all subjects. I know regardless of what their results are, we will buy them something. Both of them put in efforts in their studies. In the boxes: bread with nutella (Z) & jam(L), sausages, grapes, oranges & strawberries. 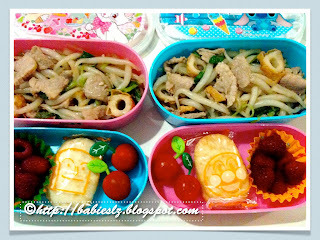 Yes, another 2 last mins bento for my babies again. They were on their way out of the house that I managed to pass these to them. These were supposed to look like snails but not at all! Of coz my LZ didn't forget it. They made cards for me! Z drew 2 cards and L was so sweet to put Beanie's name in for the card she made. All these was done many days ago.... They were actually very excited.. Few days ago, LZdaddy gave them extra pocket money so that they can get something for me from their school bookshop. They were very disappointed that all the flowers were sold out by the time they go there during recess. My sweet babies massage for me instead and Beanie danced for me with the 'Nobody nobody' song. It doesn't matter if we celebrate the occasion or whether I received any flowers.... What most important is that my family is with me. Thank you my Babies... Mommy loves all of you! !